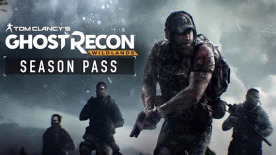 Extend your Ghost Recon® experience with the season pass, which includes two major expansions, equipment packs for the campaign, and an exclusive vehicle. The season pass also grants you one week early access to 6 Ghost War PvP post-launch classes! "Unlock for free 6 PVP Post Launch classes one week earlier! • Narco Road: Get the full spectrum of the narco life as you tear through Bolivia using new vehicles in a series of fast paced missions. Infiltrate various gangs and take out their leaders one by one. • The Unidad Conspiracy missions : Destabilize the alliance between Santa Blanca and Unidad in the Media Luna province. Digital Content such as XP booster""
This content requires the base game Tom Clancy's Ghost Recon® Wildlands in order to play. This is a Uplay Season Pass, and is incompatible with the Steam version of this base game.